DALLAS (AP) — With Ben Bishop as stubborn as ever in goal, a scoreless tie after three periods would have been enough to give Dallas the Western Conference’s top wild-card spot Saturday night. 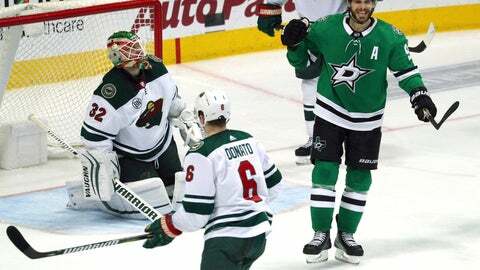 The Stars‘ offense provided some insurance, sealing the deal. Tyler Seguin broke open the game with two third-period goals, Tyler Pitlick added another and the Stars beat the Minnesota Wild 3-0 behind Bishop’s career-high seventh shutout of the season. “The fun begins now,” rookie Stars coach Jim Montgomery said. Dallas will open the playoffs against Nashville, which rallied to win a three-team race for the Central Division title. The Stars needed at least a tie to stay ahead of second wild card Colorado. Seguin has missed that fun during the last two seasons. Montgomery said being in front for rebounds was a point of emphasis during the second intermission. Bishop made 24 saves while recording the 31st shutout of his career. He finished the season with career bests in save percentage (a league-leading .934) and goals against average (1.98). “It’s your job,” Bishop said, “so when you have the numbers, obviously it’s nice, but that’s all in the past now. The Stars were 2-0-1 in three games at Nashville this season. In the scoreless second period, Dallas had an even bigger advantage in shots at 20-5, but only the Wild put the puck in the net. Montgomery challenged Greg Pateryn’s slap shot from the blue line that went past Bishop 18 seconds before intermission. The video review showed that Minnesota was offside on that possession. Wild defenseman Nick Seeler and Dallas center Radek Faksa energized the second period with two scuffles. They were penalized for roughing at 7:05. After leaving the penalty box, they went back right back in for fighting at 9:11. Stars: Begin the Stanley Cup playoffs at Nashville.